Why Use CinemaHosting.com for Your Theatre Web Design? 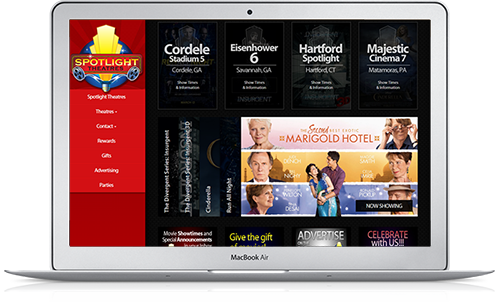 A cinema website is an amazing tool that can help generate increased attendance for your business. Obviously, as more people come through the door, your revenue and profit will increase. Creatively using your theater website can help you reach a diverse group of customers (everyone uses the web now…) and convince those customers to see more movies, more often. So why is Cinemahosting.com uniquely qualified to support and design your theatre web site? Simple: We understand web design AND the cinema industry. You can control the content of your website, on your time, without having to call tech support or your internet provider every time you need something changed. Communicate with your customers via an AUTOMATIC newsletter that provides showtimes, general movie information and any special announcements every week. We are experts in search engine optimization (you came here, right?) and will help you reach more customers by refining your theatre website to include recognizable key words. We know theatre websites can be expensive…but they don't have to be. CinemaHosting.com offers affordability and we can have your effective cinema website up and running quickly.